Iranian Supreme Leader Ayatollah Ali Khamenei accused U.S.-backed Gulf Arab states of carrying out a shooting attack on a military parade that killed 25 people, almost half of them members of the country’s elite Revolutionary Guards. The bloodshed struck a significant blow to the oil producer, which has been relatively stable compared with neighboring Arab countries that have grappled with upheaval since the 2011 uprisings across the Middle East. The Ahwazi Arabs are an Arab community in Iran which resides mostly in the resource rich Khuzestan Province in southwestern Iran, bordering Iraq. This area is known as Ahwaz by the Arab community, and the capital of Khuzestan is Ahvaz. Ahwazi Arabs are the largest Arab community residing in Iran. According to Amnesty International, Ahwazi Arabs face discrimination by the authorities concerning politics, employment and cultural rights . There has also been many arrests of Ahwazi Arabs who have converted to Sunni Islam, which is considered a crime in Iran according to the British daily newspaper The Guardian. meanwhile, according to Islamic Republic of Iran, there is not such crime/penalty in its law for converting to Sunni. The rise in conversion to Sunni Islam is partly a result of anti-Arab racism, the perceived crackdown on the Arab identity of the region and the view that Sunni Islam is closer to the Arab roots of the Ahwazi Arabs. According to the International Campaign for Sunni Prisoners in Iran (ICSPI), the crackdown is due to the Iranian government’s alarm at “the rise of Sunni Islam among the Ahwazi Arabs in the traditionally Shia-majority Khuzestan province. As a result of these conversions, Sunni Arabs across the Middle East have increasingly shown support for the Ahwazi cause. 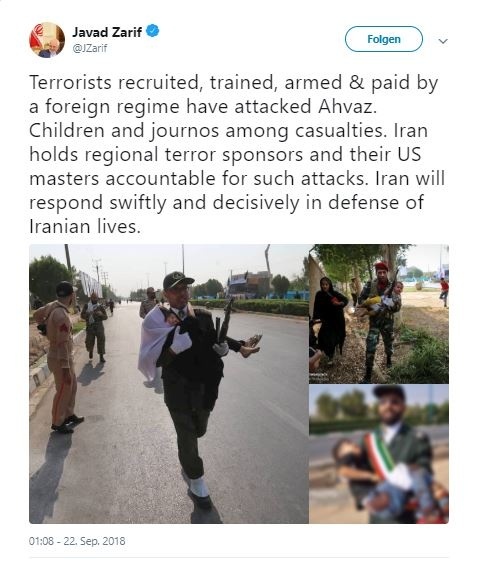 Iran respondent swiftly…., however not with the expected finger pointing towards USA, KSA or Israel – Iran called on the ambassadors of the Netherlands, Denmark and Britain after the assassination of a military parade in the city of Ahvaz. The three European countries are accused of actively protecting Iranian opposition groups, which Iran regards as terrorist organizations, reports the IRNA news agency. As usually Iran’s supreme leader, Ayatollah Khamenei, went out and accused US-supported Gulf States of being behind the attack. What a surprise…. “This crime is a continuation of the plans of the puppet states to the United States, and their goal is to create uncertainty in our beloved country,” Khamenei said in a statement on his website. The Ahwazi Arabs managed to crack the ‘Iran’s regional superiority’. 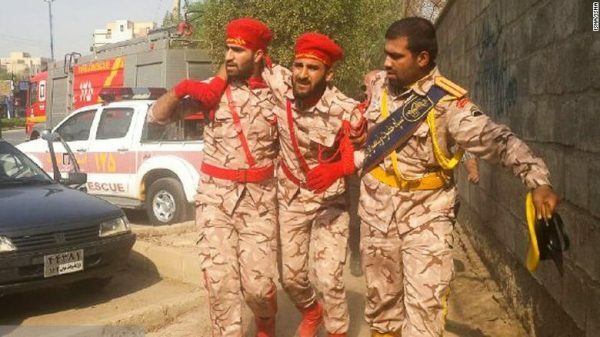 On Saturday, the Arab separatist group “Ahvaz National Resistance” took on the attack. At least 25 people were killed after four men opened fire against a military parade. The already tense relationship between Iran and its archival era Saudi Arabia is thus threatening to worsen further, Reuters reports. Iran have been training and arming Hamas and Hezbollah and now they claims that the perpetrators were trained and armed by another country. That is normal when you are at war with your enemy. The region where Ahvaz is located has a large Arab minority and the separatists want to break away from Iran. Don’t forget, the arabs don’t like you.